If you want to apply CopyMask2Layer to a rotobezier mask, you first need to convert it into a manual bezier mask (by disabling the checkbox Layer->Mask and Shape Path->RotoBezier in the AE menu). 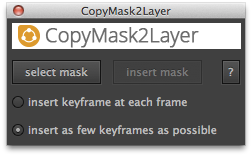 CopyMask2Layer works only with 2D layers. It is always frustrating when I paste a mask and it has scaled or done some other unanticipated change. I'll look forward to seeing how it will impact my workflow. Jeff Petersen during his beta tests. I love this script. At first I didn't think it was going to be all that useful but once I used it for awhile I have to say it's one I don't know how I lived without this tool up to now.